We buy records on the CHARISMA record label - CALL US! Home / Sell my record collection / Charisma record label"
The early CHARISMA record label recordings were on a pink “scroll” label. This label was later replaced by the more famous “Mad Hatter” label. 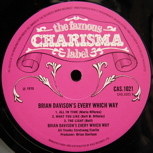 “The Famous CHARISMA Label” scroll logo. Known early on as “THE FAMOUS CHARISMA LABEL” it became an institution in the British music scene. Their biggest selling early acts were Genesis with Peter Gabriel whose album covers often mirrored the style of the Mad Hatter logo. The CHARISMA record label was also responsible for the release of the Monty Python’s Flying Circus comedy albums too. The CHARISMA record label was very much seen as the spiritual home of the prog and subversive and there were a number of rarer LPs released on it. As with all larger labels, there are some re-issues and variations and it is worth calling me on 07791 633362 to help work out what it is that you may have for sale. Remember – We buy good condition vinyl on the CHARISMA record label for the fairest prices.